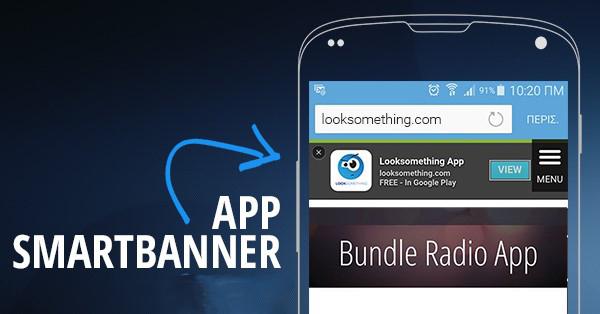 Smart App Banners are presented unobtrusively at the top of a mobile webpage to inform and encourage users to open the native app or install it if they already haven’t. They provide a direct link to download the mobile app depending on each visitor’s device. When the mobile app finishes downloading, the “View” button changes to “Open” and tapping it will launch the app. If the mobile app is already installed on a device, the banner intelligently changes its action and tapping it will simply open the app. Smart App Banners are an incredibly valuable tool for converting web traffic into app users that will regularly engage with your app. Please note that if you have purchased a Full Pack (Website & Mobile Apps) we will add the Smart App Banner to your mobile site for you. How can I find my iOS App iTunes ID? Your ID can be retrieved from the direct link of your app in iTunes. Therefore, your iOS app ID in the above example would be 123456789. How can I find my Android App ID? You have to copy everything after “id=“; in this case: com.radio.looksomething, will be your ID. How can I find my Windows App ID? Please contact support@looksomething.com in order to learn more about Windows App IDs and where you can find them. After locating your app IDs you will have to add the smart app banners to your website. In case your website is built on WordPress, you will firstly need to install the App Banners plugin by visiting https://wordpress.org/plugins/appbanners. Activate the plugin, then go to Settings --> App Banners and enter your App Store IDs, Author, App Title and Price (in case of paid apps). If your website is built on Joomla, you will need to activate App Store Smart Layer plugin by visiting https://extensions.joomla.org/extensions/extension/mobile/mobile-apps/app-store-smart-layer. Subsequently, you have to customise the settings of the plugin, providing your mobile apps IDs. In case your website is built on any other platform you will need to integrate the code into your website's core files if you are familiar with coding. We provide a pre-made customised code and instructions that can be found at http://goo.gl/6HsZOI.